In the digital era, books seem to be on the very edge of their existence. 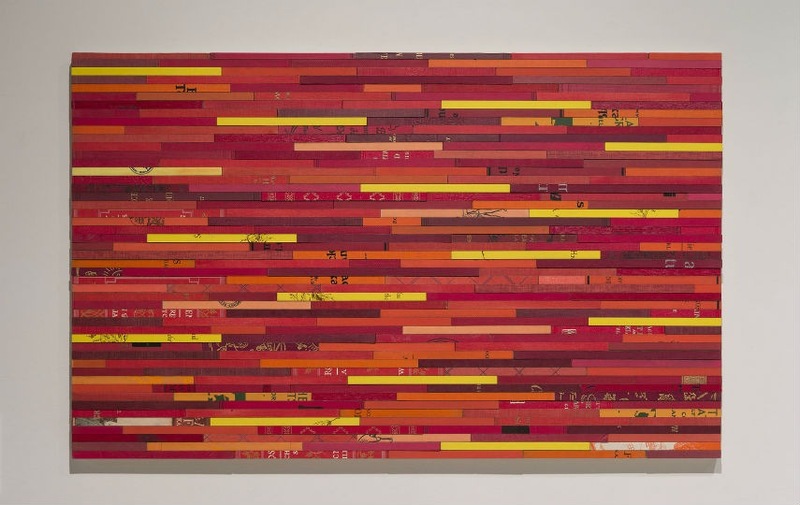 Karen Hawkins’ work pays homage to books that are gradually disappearing. A passionate book lover since her childhood, Karen Hawkins is making art pieces of them. She is using the old ones, withdrawn from the libraries or sold for a dollar in discount stores and putting them in new, different context, striving to change the way people experience the books. They are becoming material and inspiration for her three-dimensional sculptured forms. 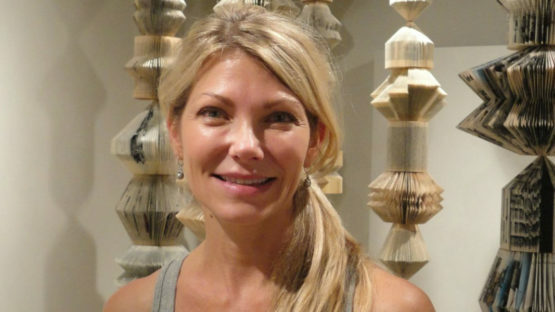 Karen Hawkins’ work is derived from books. 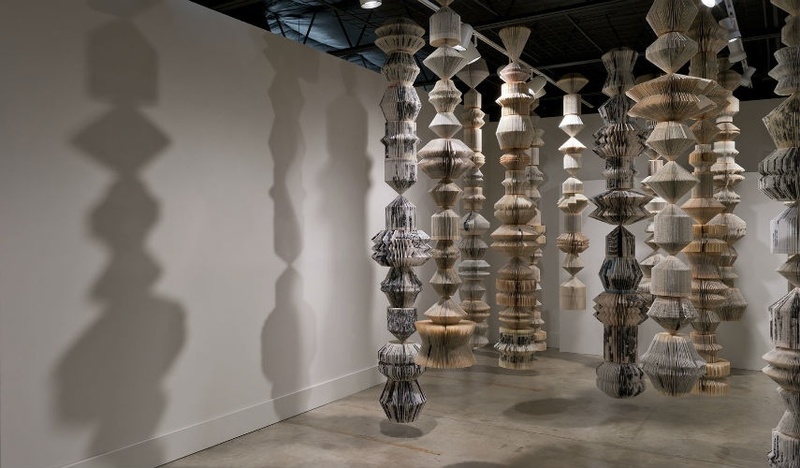 She uses dictionaries, black and white picture books to construct her sculptures, hanging pillars and wall pieces. Book content is nor relevant for her. She is adjusting them as objects in the common shapes from the everyday life. 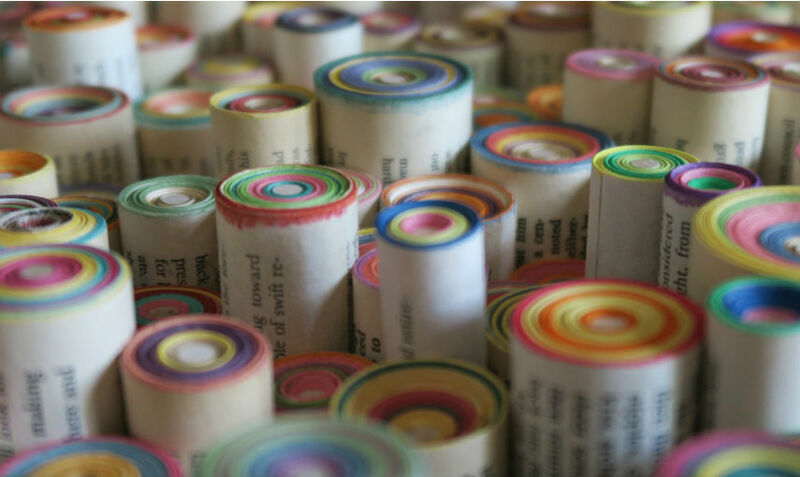 College yearbook pages became hanging columns of Totem pieces and small parts of paper cut from market paperbacks and rolled into tight scrolls made specific installations of Jellyrolls. Changing the structure of the book, Hawkins expands its physical properties. By cutting and folding it became a totally independent object of art. Totem installation consists of 14 pole-like sculptures hanging from the ceiling. Every pillar is 8 to 10 feet long, constructed from different geometric figures. Besides rolling and inverting pages, Hawkins uses one more book technique, so-called book-bricks. Removing the covers and revealing the details of a book’s binding, she dips the bricks in wax and putting them in wooden frames. She created two collages in that manner, one in red, and the other in blue shades. Hawkins is a book lover since her childhood days when she was visiting the bookmobile every week. And now, the books still have the same significance in her life, as an object of her artistic expression. Private collectors are starting to recognize her aim, commissioning biographical pieces, such as using sheet music for a musician or law books for a lawyer. In Hawkins work, the page is playing a different role. Wrenched from the literal context, it becomes the meaning of the past conveyed trough form. Karen Hawkins is represented by The Cat Street Gallery. Karen Hawkins lives and works in Detroit, United States.